Fall is one of my favorite times of the year. I love the beautiful colors of green turning into gold, orange and red. This week’s challenge at Hand Stamped Sentiments is an inspiration challenge. The images inspired me to use the Falling for Leaves bundle to create this card. I stamped the Crumb Cake layer with the green foliage leaf then added the Very Vanilla layer which I stamped with the Artisan Textures using Versamark then heat embossed with Copper embossing powder. I die cut the leaves then added sparkle with clear Wink of Stella and basic rhinestones. The ‘Thankful’ greeting was also embossed with Copper then die cut with the Pretty Label punch then embellished with 1/4″ copper trim. What kind of project will you create. Check out the other projects from the design team. This week’s challenge is a color challenge, Night of Navy, Pink Pirouette and Gold. I created my card using the Swirly Bird Bundle. This bundle is so much fun! You can create swirlies in different sizes and it has a great dotted stamp which adds texture. I used this stamp with gold ink for a background. Here’s my card inspired by page 152 of the NEW Stampin’ Up! Catalog and Idea Book. I stamped the ‘Thank You’ sentiment from the Rose Wonder stamp set with Versamark and embossed with gold on to a strip of Whisper Water and cut the edges to create a banner. I then embellished with gold sequins. Be inspired by this color challenge and join us at Hand Stamped Sentiments. This week’s challenge is a sketch challenge at Hand Stamped Sentiments. I created this card with the Market Fresh stamp set and coordinating dsp. The card is CASED from page 116 of the Stampin’ Up! Catalog and Idea book. There are so many great project ideas in the catalog. I always see something new every time I go through it. I used the watercolor technique to color the image and embossed the card base with the brick embossing folder. A super cute and easy card to make. 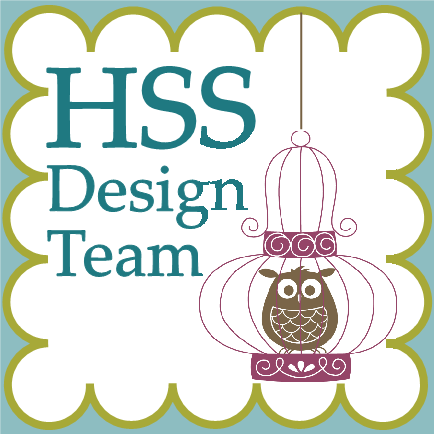 Upload your project at HSS and show us what you created with this sketch. See what our design team has created for inspiration! My inspiration for my card this week comes from this week’s HSS Inspiration Challenge and from page 118 of the Stampin’ Up’s! Catalog and Idea book. I love I can peruse through the catalog and see something different every time! I used the NEW In-Color Mint Macaron with touches of gold and Bermuda Bay sequins, with black. The photos of the lake and water made me think of the dragonflies I see in may backyard. I love the Work of Art Stamp and Gorgeous Grunge stamp sets because you can create swashes or splatters of color that look like you water colored or painted on ink. 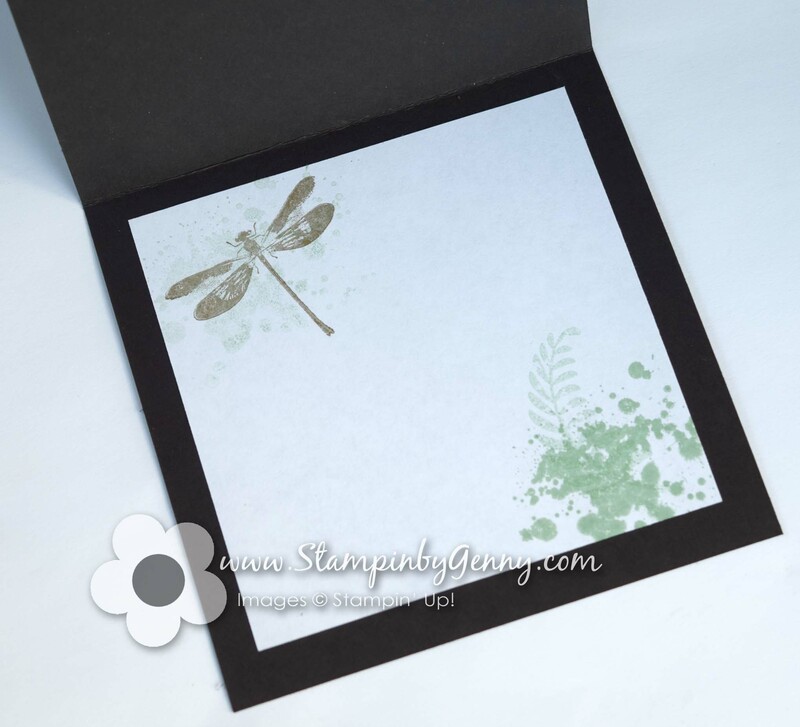 These I used for the background then stamped the dragonfly from the Awesomely Artistic stamp set and heat embossed with gold as well as the ‘you’ in the sentiment. To make the rest of the sentiment stand out I used some Washi tape. Go to Hand Stamped Sentiments to check out how the Inspiration Challenge inspired our design team and I hope you’re inspired to create a project and join us! This week’s challenge at Hand Stamped Sentiments is an inspiration challenge. The image that inspired me most was the sky background. I used the acrylic block stamped background technique to create the background for my card. Click here for a tutorial on this technique. I used ink colors Coastal Cabana, Marina Mist and Wisteria Wonder on water-color paper. The flourishes are stamped in Night of Navy. I like how the ink looks on the texture of the water-color paper. For extra sparkle, I used Dazzling Details all over the background image and flourishes and added rhinestones colored with Coastal Cabana blendable markers. The ribbon is Lost Lagoon. It was just the right layer for my “thanks” sentiment. Here are the inspiration images from Hand Stamped Sentiments. I hope you join us for the challenge.